Join us on Saturday, May 4th for the 10th Annual “Strike Out Abuse” fundraiser, benefiting Women and Children’s Horizons. This year’s has a Star Wars theme, so plan your costumes now! $50 registration fee per team; maximum of 6 bowlers per team. Each team member is encouraged to raise $75 to support W&CH and local survivors of domestic and sexual violence. Registration fee includes three games, shoe rental, soda, food and fun! 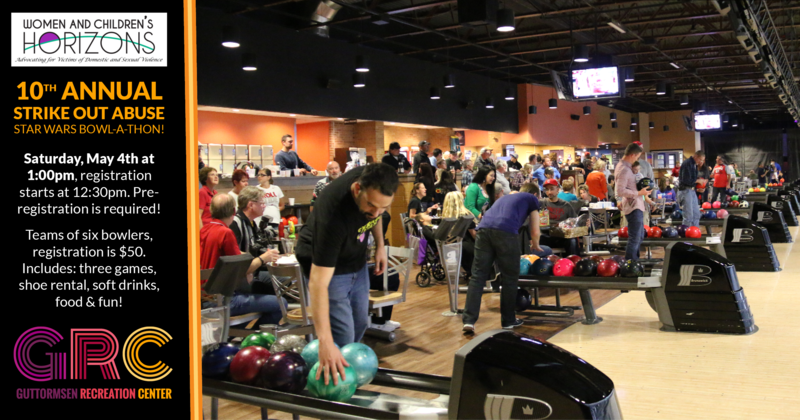 Team check-in begins at 12:30 pm; bowling starts at 1:00 pm. Lots of fun activities include a silent auction, 50/50 raffle, themed games and MORE!